Today's So Shoe Me is the Rebel by Grey City, $235, available at Solestruck. 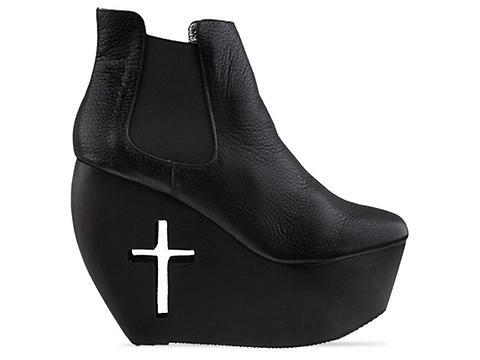 Cutout crosses make this wedged wonder the Holy Grail of black boots. With a simple shape and sky high wedge+platform combo, these black boots could be just another basic staple - until you notice the cross detail which adds a modern signature edge. 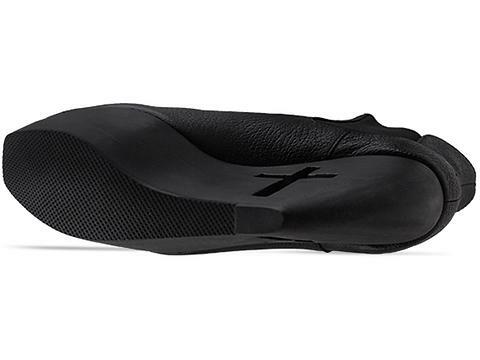 The elastic sides offer and easy-on, easy-off style while the all black colorway kicks this wedge up with a downtown design. This simple shape can be paired with just about anything and the cool cross cutout will add an unexpected pinch touch of cool to your everyday favorites. Pair these ankle boots with a pair of high waisted leather shorts, a deep-v bodysuit, an oversized plaid button down and a signature silver earcuff for a street wise nighttime look. So Shoe Me a pair of wedged ankle boots that cross the line between classic and avant garde with a cool cutout heel.